Our special promotional packages are amazingly affordable because the participating resort provider is paying up to 77% of the price of the room in exchange for your time during the resort preview. The resort – not BookVIP - decides what (if any) additional gifts are included in the package. The promotional package you purchased included two (2) tickets to Universal, as was advertised on the website. Although you had to option to purchase additional Universal tickets when you made the reservation, you did not do so. Because customer satisfaction is BookVIP’s top priority, we have attempted to contact you and look forward to hearing from you. 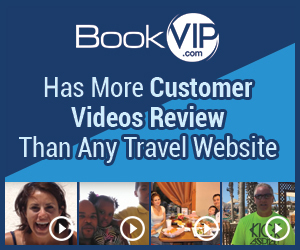 We send over 100,000 people on vacation per year and have more customer video reviews directly from than any other travel site: http://bookvip.com/sitereviews. This was a complete misrepresentation of what we were getting, accommodations were old, dirty, roaches. After paying several hundred dollars for our package we wereade to leave a deposit of $150.00 and a major credit card. They said a 90 minute presentation the took over 4 hours!!!! Review #876100 is a subjective opinion of tas65770127.